To paraphrase The Fixx's "One Thing Leads To Another", for Barack Hussein Obama, "One lie leads to another...one lie leads to another." Obama said that it was the Kennedy family that paid for his "Kenyan father to travel to America on a student scholarship that lead to meeting his mother from Kansas." The only thing wrong with Obama's statement is...yeah, you guessed it...it's not true. He lied...again. Contrary to Obama's claims, the Kennedy family did not provide the funding for a September 1959 airlift of 81 Kenyan students to the United States that included Obama's father. According to historical records and interviews with participants, the Kennedys were first approached for support for the program nearly a year later, in July 1960. The family responded with a $100,000 donation [really not much of a donation, considering the vast wealth of the Kennedy's. - Drake] most of which went to pay for a second airlift in September 1960. Obama spokesman Bill Burton acknowledged Saturday that the senator from Illinois had erred in credit the Kennedy family with a role in his father's arrival in the United States. He said the Kennedy involvement in the Kenya student program apparently "started 48 years ago, not 49 years ago as Obama has mistakenly suggested in the past"
In his speech commemorating the 42nd anniversary of the Selma civil rights march, Sen. Obama linked his father's arrival in the United States with the turmoil of the civil rights movement. Although the airlift occurred before John F. Kennedy became president, Obama said that "folks in the White House" around President Kennedy were looking for ways to counter charges of hypocrisy and "win hearts and minds all across the world" at a time when America was "battling communism." "So the Kennedys decided 'we're going to do an airlift,' " Obama continued. " 'We're going to go to Africa and start bringing young Africans over to this country and give them scholarships to study so they can learn what a wonderful country America is.' This young man named Barack Obama got one of those tickets and came over to this country. He met this woman whose great-great-great-great-grandfather had owned slaves. . . . So they got together and Barack Obama Jr. was born." A more accurate version of the story would begin not with the Kennedys but with a Kenyan nationalist leader named Tom Mboya, who traveled to the United States in 1959 and 1960 to persuade thousands of Americans to support his efforts to educate a new African elite. Mboya did not approach the Kennedys for financial support until Obama Sr. was already studying in Hawaii. What outrageous lie will Obama tell next? That he was on a gunboat in Cambodia during Christmas Day in 1968? That it was he, not Albert Gore, Junior, who invented the internets? That he dodged sniper fire in Tuzla? It is also time for the MSM to cease and desist referring to Ted Kennedy's Poodle as "the senator from Illinois," in what is a not so subtle reference and attempt to portray him as the next Abraham Lincoln, which he most definitely is not. David how could you! 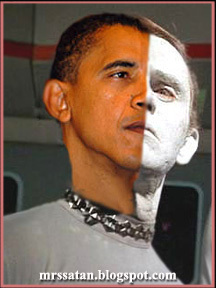 How could you defile the image of the late great Frank Gorshen by stitching half of Obama to him? (I'm not sure he should be the black half anyway). Between the poodle's Kennedy link and MrsSatan's Bosnia snipper dodge I'm not sure who lies the most! But it will be fun to watch because I am certain more and bigger whoppers are to come! I couldn't help myself, Dane. I just couldn't. I agree Frank Gorshin was indeed "great". My apologies to all Trek and Gorshin as Bele fans everywhere. Thanks for visiting and commenting! !